Robin Youngs, Edward Fisher,	The Journal of Laryngology & Otology, Volume 128 Issue 5, p 393. I P Tang, S R Freeman, G Kontorinis, M Y Tang, S A Rutherford, A T King, S K W Lloyd,	The Journal of Laryngology & Otology, Volume 128 Issue 5, pp 394-399. E Seckin, F Suren Basar, S Atmaca, F F Kaymaz, A Suzer, A Akar, E Sunan, M Koyuncu,	The Journal of Laryngology & Otology, Volume 128 Issue 5, pp 400-405. D A Moffat, R A Parker, D G Hardy, R Macfarlane,	The Journal of Laryngology & Otology, Volume 128 Issue 5, pp 406-415. N Ahmad, A Wright,	The Journal of Laryngology & Otology, Volume 128 Issue 5, pp 416-420. O Guntinas-Lichius, C Wittekindt, M Baier, J J Manni,	The Journal of Laryngology & Otology, Volume 128 Issue 5, pp 421-424. J Rousset, M Garetier, J-C Gentric, S Chinellato, C Barberot, T Le Bivic, P Mériot,	The Journal of Laryngology & Otology, Volume 128 Issue 5, pp 425-430. H Baran, K M Ozcan, A Selcuk, M A Cetin, S Cayir, M Ozcan, H Dere,	The Journal of Laryngology & Otology, Volume 128 Issue 5, pp 431-437. B-S Yin, M S Miah, S S M Hussain,	The Journal of Laryngology & Otology, Volume 128 Issue 5, pp 438-441. E Erkul, A Yaz, C Cİngİ, H M İnançlI, T San, C Bal,	The Journal of Laryngology & Otology, Volume 128 Issue 5, pp 442-446. K Badran, P Jani, L Berman,	The Journal of Laryngology & Otology, Volume 128 Issue 5, pp 447-453. M S Hashemipour, M Yarbakht, A Gholamhosseinian, H Famori,	The Journal of Laryngology & Otology, Volume 128 Issue 5, pp 454-462. H Riechelmann, E C Blassnigg, C Profanter, K Greier, F Kral, B Bender,	The Journal of Laryngology & Otology, Volume 128 Issue 5, pp 463-467. S N Bandyopadhyay, S Das, S K Das, A Mandal,	The Journal of Laryngology & Otology, Volume 128 Issue 5, pp 468-474. S Fang, K Argiris, N Padgham,	The Journal of Laryngology & Otology, Volume 128 Issue 5, pp 475-477. M Cresswell, J Buckland, P West, O Sparrow,	The Journal of Laryngology & Otology, Volume 128 Issue 5, pp 478-480. K Chaidas, S Toma, C Hopkins,	The Journal of Laryngology & Otology, Volume 128 Issue 5, p 481. G Malhotra,	The Journal of Laryngology & Otology, Volume 128 Issue 5, p 482. P Kand, S Basu,	The Journal of Laryngology & Otology, Volume 128 Issue 5, pp 482-483. Elfy B Chevretton, Sherif Haikel, Simone Hadjisymeou, Leslie Michaels, Ann Sandison, Steve Connor, Ata Siddiqui,	The Journal of Laryngology & Otology, Volume 128 Issue 5, pp -. 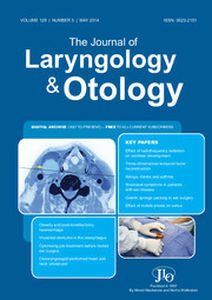 The Journal of Laryngology & Otology, Volume 128 Issue 5, pp -.